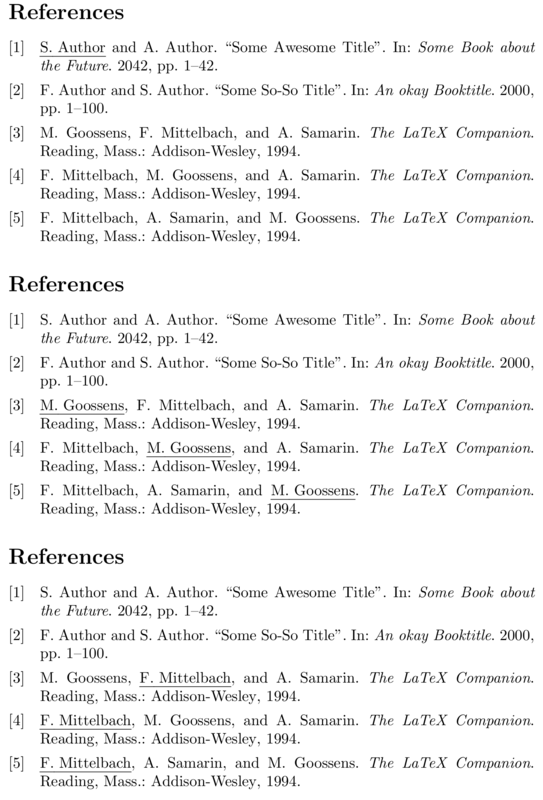 I need to underline all occurrences of a person's name in the bibliography, using ClassicThesis and BibLaTeX. I would prefer to change the tex file only (not the bib or bst). So far, I have tried this and this approach without success. The code for those approaches is reported in the MWE below in commented form. Building upon Audrey's answer to Make specific author bold using biblatex we can come up with the following. Note that we did not patch name:given-family, we redefined it. That is because we need a slightly different grouping setup than when using bold text with the \bfseries switch. Not the answer you're looking for? Browse other questions tagged biblatex classicthesis underline or ask your own question.